As children, we always looked eagerly ahead toward cookie season, otherwise known as the time each year when Girl Scout troops would flood our schools, supermarkets and neighborhoods with their delicious cookies. Our favorite? The beloved thin mint. Is there anything better than the marriage of chocolate and mint? We think not. 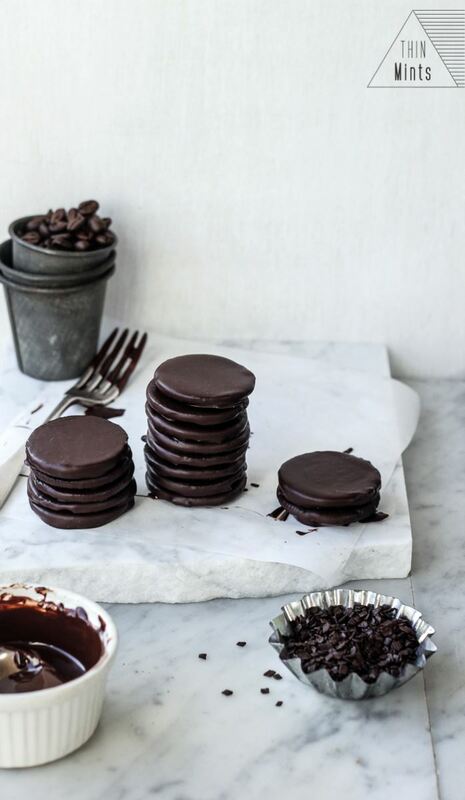 So you can imagine that when we stumbled upon this simple recipe on Pinterest, which simply involves oreos, melting chocolate, and peppermint extract, we couldn't wait to whip up some DIY thin mints of our own. Here's to Saturdays in the kitchen, and delicious cookies to boot! Melt (and temper, if you can be bothered – see notes) the chocolate, then stir in the mint extract well. Dip an oreo half in the melted chocolate, turn to coat using a fork. Use the fork to remove the oreo from the chocolate, tap it on the edge of the bowl a few times (to let excess chocolate drip off) and transfer to a lined cookie sheet. Leave at room temperature until set.